Soluble microgranular formulation of Iron chelated with EDDHA, ethylendiamino-di (ohydroxyphenylacetic) acid. The main characteristic of this product is the presence of the stable ortho-ortho form of the EDDHA chelating agent. Iron chelated with this isomer, once distributed in the soil, is released to the plant even in the case of soils with high pH values becoming essential for the treatment of iron chlorosis, especially in calcareous soils where iron salts are precipitated and locked in the soil, unavailable to the plant. Products applications are suggested all the times that the plants show symptoms of yellowing between the “veins” of the leaves, especially noticeable in young shoots. 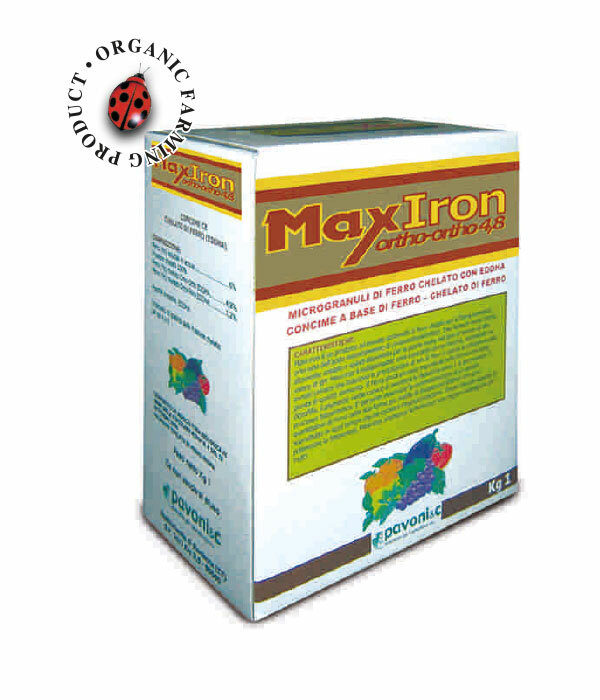 Because of this capacity to improve photosynthesis, the chelated iron promotes blooming and better fruit development. Dosage always depends on different factors (plant’s age, growth stage, climatic conditions, temperature, etc). The product displays good miscibility and compatibility, however, we advise preliminary tests and treatment of a few plants before extending to the whole area.